MGM Resorts International made its reputation, quite simply, by being the best. Bellagio, Luxor, and Mandalay Bay in Las Vegas are among its properties, and the company is rapidly building its premium brand in the United States and worldwide. Its commitment to the highest quality guest experience is legendary in the industry. 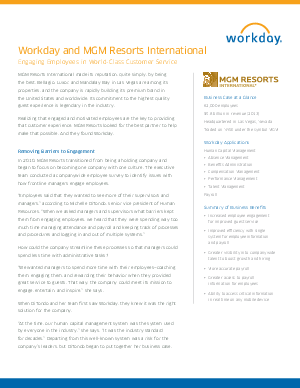 Realizing that engaged and motivated employees are the key to providing that customer experience, MGM Resorts looked for the best partner to help make that possible. And they found Workday.